I have really grown to love stories from our armed forces and especially the Navy SEALS. I love the stories of men banding together as brothers. Sacrificing and fighting hard for a common purpose. I have also grown to regret not serving my country. 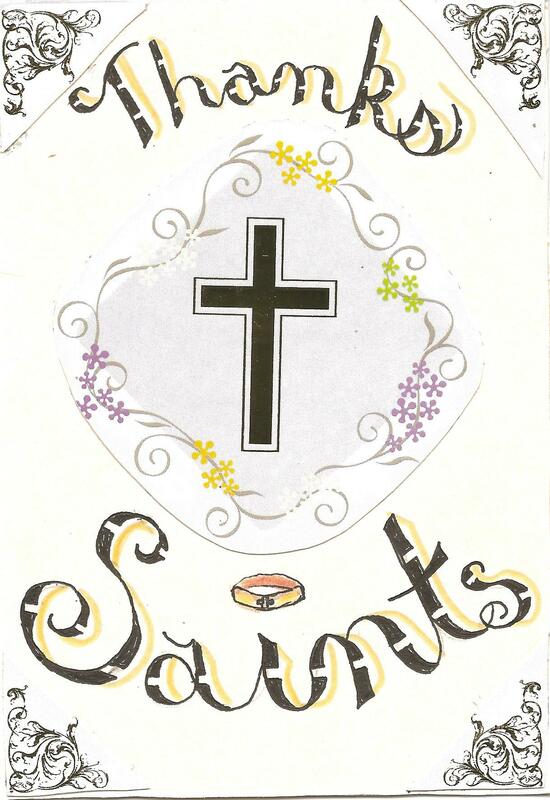 Serving with the Saints Prison Ministry has quenched some of that desire. I love the group here in Illinois that I serve with and I love the brothers across the country that I get to call teammates a couple of times a year. There have been countless stories over my brief five years in the ministry in which I have seen missionary athletes make sacrifices for the sake of sharing the Gospel as well as making sacrifices in serving each other. I have seen guys wake up at crazy hours of the morning, miss events in favor of a Saints outing, and sacrifice playing time in order to spend more time sharing the Gospel with inmates. I have seen guys serve each other by encouraging them on the field or after a Gospel presentation. I have also seen our guys serve by giving up their seat on a long trip or by making sure someone else got to eat first after a long day. I have seen our guys serve by comforting a hurting teammate who just lost a loved one or who had a sick kid (or grandkid!) at home. I have also seen our guys serve on the toughest of the front lines by confronting a teammate who needs to be confronted about a sin issue. One of the unexpected blessings of starting a team here in Illinois is the godly men that God has brought into my life to serve alongside. I have grown and seen them grow as well. 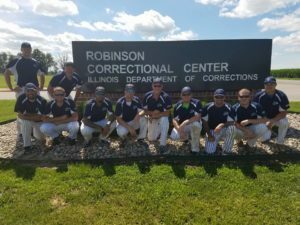 Our trip to Robinson Correctional Center was typical of the Illinois Saints experience – once again a very early morning and a three hour drive – but sharing it with these men makes it easy to face that long drive. Upon arriving at RCC, we found we had the opportunity to play 4 games against a few different inmate teams. We won the first two games of the day on the backs of some big time hitting from our guys. 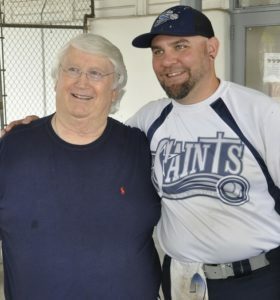 In between the first two games, Jesse Miller shared his life story about how he came to know Jesus as his Savior, and Darrell Pine – a charter member of the Illinois Saints – once again did a great job of sharing the Gospel with the men there. After we returned from lunch, we again did battle on the field, winning the first game and tying the second game before they called yard. However, in between games Jeremy Test shared his testimony about how he came to know Jesus. I have heard his testimony several times and I am very proud of the godly young man he has become. Jeremy is also a charter member of the team and has grown to become one of the leaders on which I depend heavily. After JT finished, I shared the Gospel. 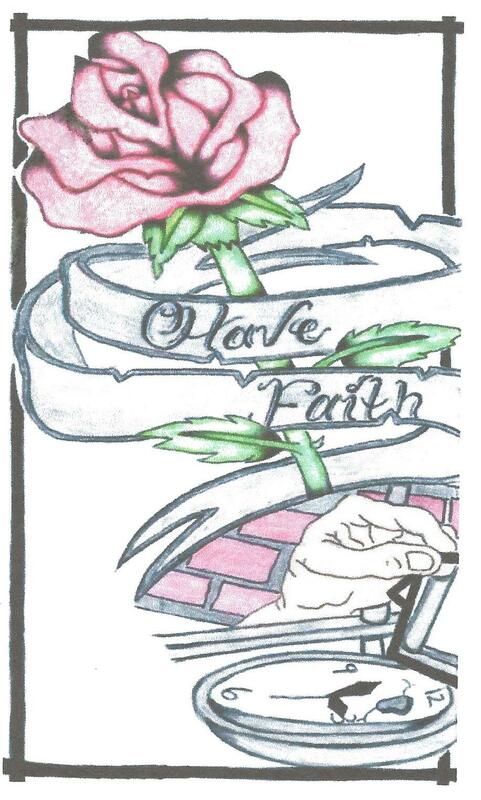 It is always an honor to share the Gospel in prison, and I was blessed with a very attentive crowd. Overall on the day, we handed out 295 Gospels of John and saw 58 men make a first time commitment to follow Jesus! According to the Officer in Charge, we were the first outside team to come in and minister at Robinson CC in more than 15 years! He was very pleased with the way we interacted with the inmates, and commented that the day will be talked about for a long time. I believe the quality of the men that I call my brothers has a lot to do with his impression of our ministry! I am so proud of these men, and I hope it will always be like this! One of my teammates recently sent me an article entitled, Prison Ministry: A Waste of Time, Right? 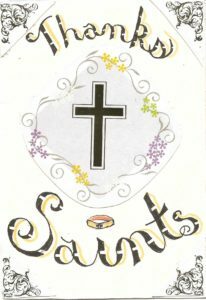 It is a sentiment we have heard often as a ministry, and one I believe that all those in the Saints Prison Ministry’s family need to consider and have firmly answered in our own hearts and minds, so we can be ready to give an answer to those that would challenge the validity and necessity of our ministry. We can’t be so naive (and I don’t think we are) to believe that every inmate we share truth with will respond to that truth in the right manner. As I have said many times before and early on in my time with the Saints, all we are responsible for is to be obedient to do what God has called us to do – to share His truth and then leave the results up to Him. So, I challenge all of us (myself included) that if we ever start to question if our ministry is worth it, that we stop and understand that our service in this ministry is as much, maybe more, about our obedience to go and serve/minister as it is about what happens with the inmates. With that in mind our answer to the question posed by this article should always be an unequivocal NO! I just received your letter today and I am so thankful for your presence in my life. Your birthday card and well-wishes made my heart full of joy. 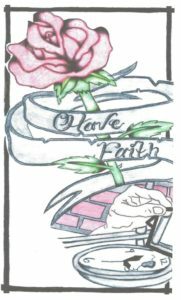 Thank you so much for what your ministry does for prisoners. I especially enjoyed reading The New Creation and the word search you included. May God bless your hearts and those of your ministry’s volunteers. I pray that this letter reaches you all in health and good spirits. And that our Lord is with you always! The reason I am writing this letter is to give you thanks. I thank you because every year for the last eight years I have gotten a birthday card from you – and every year it brings a smile to my face! It lets me know that someone out there remembers me. If no one else ever sends me a card, I know without a doubt that I’ll get one from you. So once again I would like to thank you from the bottom of my heart for being a beacon of light the week of my birthday each year. I would like to thank your basketball team for taking time out of their lives to come to North Central Camp and spend time with us. The game was a blast, even though you guys stomped us, but the halftime was a special one. The story that “Q” shared with us really spoke to me because it was real talk, straight from his heart. Then when Kyle took the mic, I felt like I was the only one in the gym and he was speaking directly to me! I wasn’t even going to play in this game but something kept pushing me to go to the gym and get in the game. Now I know it was our God that wanted me to go and shake hands with some mighty fine men! Keep up the good work and God bless you all. I got it in my heart to write to you and just say thank you for your visit. I really had a wonderful time playing softball but I had an even better time just talking and hearing your stories. All of the guys that came that day will forever have an impact in my life. I can’t thank you enough for all the love and compassion that emitted from each of you. I can’t express how much of a class act you were. I hope and pray God continues to use each and every one of you and I know I will see you in heaven one day! I so appreciated the New Creation letter you sent me, especially the article called, “O God, please don’t let Jesus come today”. I cannot even come close to expressing my gratitude. You folks are definitely doing God’s will with the dedication that you are putting towards reaching out to prisons. Whether you know it or not, you have inspired the brothers here at Chillicothe to reconsider their walk of faith, or even if they have one. It was especially wonderful to see black men doing something so positive (Ed. note: he is referencing the SPM basketball team that visited last March). Where I’m from all we get credit for is stabbings, stealing, and running out on our babies – so please keep inspiring people and speaking the Word with your testimonies and talents!